in terms the different steps that the mukta jIva takes in reaching Brahman. These steps are described differently in different upanishad-s .
arcis -agni, ahaH -day, Sukala paksha, uttrAyana, samvatsara - year, Aditya - ravi, candra - moon, vidyut - lightning. agni loka, vAyu loka, varuNa loka, Aditya loka, indra loka, and prajApati loka. arcis, ahah, Sukla paksha, uttarAyaNa, deva loka, Aditya, and vaidyuta. and those who practice in the forest meditating upon Brahman with faith, will unite with agni. and thereon he comes upon the deity of the half year while the sun moves towards the north." "From that half year he reaches the year - samvatsara. From samvatsara he comes to the sun. From the sun to the moon, from the moon to vidyut, and from there that amAnava, super human, takes him to parabrahman. This is known as the path of the gods or the path to Brahman. Those who go by this path never again return to this world of samsAra". The other upanishadic passages are not given here, but these are discussed in detail in bhagavad rAmAnuja's SrI bhAshya (sUtra 4.3.1). since they all list the same path in the final analysis, but do not list all the steps. The sequence of these steps and their relative arrangements is not arbitrary in any sense, but is based on intense analysis of the different upaniahad-s, and coming up with a sequence that is consistent between the different upanishadic declarations. A detailed discussion of the sequencing is given in bhagavad rAmAnuja SrI bhAshyam - brahma sUtra 4.3.2. These twelve are the deities that are established by bhagavAn to lead the mukta in his ascent to paramapadam from this world. They are also called AtivAhika-s or `those that lead the way'. vihAyasa gatiH - The summary statement that He is the One who leads the mukta jIva to Himself. It is an entirely delightful experience to delve into nammAzhvAr's description of the ascent of the jIva to SrI vaikunTham in his pASurams, and their interpretations by our AcArya-s in particular. We get a different dimension of the function of these AtivAhika-s as the mukta jIva is received and led on his way to bhagavAn. BhagavAn's deep love for his devotee who is arriving, is expressed by AzhvAr in his delightful devotional outpouring. 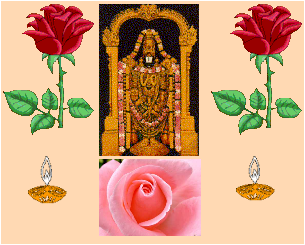 Here, vaidyuta comes first, and announces with joy the arrival of the mukta to the rest of the AtivAhika-s with his thunder (Suzh viSumbaNi mugil tUriyam muzhakkina - tiruvAi. 10.9.1). VaruNa fills the sky with water-laden clouds, as if with golden pots - pUraNa pork-kuDam (10.9.2). The oceans are dancing with joy with their rising and falling waves constantly - neer aNi kadalgaL ninRu Arttana. Not just the 12 AtivAhika-s listed above, but everyone in the AtivAhika lokam come out and stand in line and offer their obeisance to the arriving mukta, including the usually meditating and silent sages (10.9.3). BhagavAn is decorating Himself with tulasi garlands, and is waiting along with pirATTi to receive His long-lost devotee (10.9.4). The deva-s in all the worlds on the way of the mukta jIva are setting up delightfully decorated huts for the temporary stay of the mukta jIva to take rest on the way. VaruNa, indra, and prajApati are eagerly waiting at the entrance to their regions to welcome and receive the mukta, with a request to the mukta to bless them by passing through their regions - emadu iDam puguduga (10.9.5). The likes of sanaka, nArada, etc., are chanting veda-s with great delight to welcome the mukta jIva. A big festive atmosphere is prevalent everywhere on the way. High-sounding musical instruments are being played all the way along. As the mukta jIva nears the limits of parama padam, the nitya sUri-s, who are supreme in their Seshattvam, welcome the mukta to their world (10.9.8). Even the Lord is shining brilliantly in anticipation of this special occasion. The nitya sUri-s are rejoicing that at last a jIva has realized his Permanent Abode, and is joining them, and consider it their good fortune that this incident is taking place. They all welcome the mukta by offering pAdya upacAra (washing his feet) at each house as the mukta passes along (pAda'ngaL kazhuvinar - 10.9.10). It is thus that bhagavAn and pirATTi look forward to their long-lost child, and welcome the mukta to SrI vaikunTham. a) He Who is the means for the attainment of paramapadam. b) He Who travels in the form of the Sun. c) He Who travels in space through His vehicle garuDa- the King of birds. d) He Who is attained by tapasvin-s through their tapas (hA - tyAge - to abandon). SrI vAsishTha derives the nAma starting with vi as an upasarga, the root hA - gatau - to, to get, to attain; or hA - tyAge - to abandon, and adding the `asun' pratyaya according to a related uNAdi sUtra. gati means "that which is attained'. That through which one travels is vihAyasa, meaning space. vihAyasa also can refer to those who sacrifice, or those sAttvik people who perform tapas etc. Thus, vihAyasa-gatih can mean "One Who travels in space", or "One Who is attained by those who follow the sAttvik path". The amara koSa gives the meanings "sky", "bird", Lord's vishNus' Abode, etc., for the word vihAyasa - viyad vishNupadam vihAyasI. a) SrI BhaTTar uses the last of these, and gives the interpretation - tathA nirUDha bhakti parakoTibhih vihAyasam = parama vyoma padameva gamyate asmAt iti vihAyasa-gatih - He is called vihAyasa-gatih since it is through Him and because of Him that those devotees who have reached the highest stage of bhakti attain the supreme abode, namely paramapadam. divine world of parama padam". "Because of the efficacy of the bhakti yoga that has been practiced by the devotee and because of the constant meditation on the path that leads to the Supreme Abode of the Lord" - the devotee is able to see the opening by which he has to go when he leaves the body, and when the soul leaves the body through the mUrdhanya nADi or the sushumnA nADi, it leads him to the Supreme Abode of the Lord. nammAzhvAr refers to bhagavAn as "vAneRa vazhi tanda vATTARRAn"
viN ulagam taruvAnAi viRaiginRAn" (tiruvAi. 10.6.3). b)SrI Sa'nkara uses the meaning `abode' for the term `gati', and gives the explanation for the nAma as: "One Who has His abode in the firmament - referring to either Lord vishNu or His form as the Sun" - vihAyasah - vihAyAsam gatih ASrayah asya iti vihAyasa gatih, vishNu padam, Adityo vA". SrI cinmayAnanda refers to the nAma of bhagavan - sUrya nArAyaNa, in this context. SrI satya devo vAsishTha also gives an interpretation that the nAma refers to bhagavAn in the form of the Sun - vihAyase antarikshe gatih gamanam yasya sa vihAyasa-gatih - sUryah. SrI rAdhAkRshNa SAstri takes the term vihAyasa as a reference to the sky, and observes that bhagavAn is called vihAyasa gatih because He has the sky as His path - unobstructed, unsupported, vast, limitless - in the form of the Sun. He comments that bhagavAn manifests in the form of the Sun as one reflection of His immense love for His creation - priya-kRt, prIti-vardhanah etc. He will look at the next 10 nAma-s as describing bhagavAn in the forms of various aspects of the Sun. c) SrI kRshNa data bhAradvAj uses the dual meaning "sky" and `bird" for the word vihAyasa", and interprets the nAma as "One Who travels in space by means of the king of birds - garuDa, as His vAhana - vihAyase - vyomni vihAyah patinA gatih yasya iti vihAyasa-gatih. SrI satya sandha tIrtha also gives the explanation in terms of bhagavAn's garuDa vAhana - vihAyaso -garuDah, tena tena gatih yasya sa vihAyasa-gatih. d) An alternate interpretation provided by SrI vAsishTha uses the meaning `tapasvin' for the term `vihAyasa' (see first paragraph for this nAma; hA - tyAge - to abandon): "He Who is attained by the tapasvin-s through their tapas" - vihAyasaih tapasvibhih, abhigamyate prApyata iti vihAyasagatih vishNuh. a) The Light that leads to SrI vaikunTham. b) The Light that is self-luminous. c) The Light that illuminates the Sun, the moon etc. Starting from this nAma, SrI BhaTTar interprets the next few nAma-s as a description of the different steps involved in the arcirAdi mArga, the path taken by the mukta-s in their way to paramapadam. The root from which the nAma is derived is dyuta - dIptau - to shine. The uNAdi sUtra - dyuter-isin AdeSca jah (uNAdi. 2.110) results in the word jyotih starting from the root duyta. dyotyate asmAt iti jyotih - He by Whom things are illumined, is jyotih. a) SrI BhaTTar interprets this nAma as the first step in the ascent of the jIva-s to parama padam. This step is also called arcih. arcih refers to the first deity that escorts the mukta jIva to the Supreme Abode. "They unite with agni; from agni to the deity of the day, and from there to the bright half of the month”. Sri ananta ra'ngAcArya translates arcih as a reference to agni). The mukta-s (Released souls) are led along the stages beginning with arci (light), and this is well-known from the upanishadic texts. arcih and the other deities are known as AtivAhika (Escorting Angels) because of the nature of their duty which is to lead the mukta-s to the Supreme Abode. SrI v.v. rAmAnujan gives reference to the gItA (Sloka-s 8.24 to 8.27), where the path taken by the knowers of Brahman to reach Brahman is described. "Light in the form of fire, the day, the bright fortnight, the six months of the northern course of the Sun - the knowers of Brahman who take this path go to Brahman." By contrast, those who reach svarga (a temporary abode where the jIva enjoys the benefits of his good karma and then is reborn in this world) take the dhUmAdi mArga (Slokam 8.25) - smoke etc., and those who are headed for narakam take the yAmaya mArga according to the SAstra-s. In divya prabandham also we have the description of the path taken by the knowers of Brahman. SrI rAmAnujan gives reference to nammAzhvAr's tiruvAimozhi 10.9 (SUzh viSumbaNi), where the ten pASuram-s describe in detail the welcome that is offered to the mukta jIvan on his way to SrI vaikunTham. He Who is the guiding light for those devotees whose souls leave the body through the sushumnA nADi, is jyotih. b) SrI Sa'nkara gives the interpretation that the nAma signifies that bhagavAn is "One Who shines of His own accord". He quotes the mahA nArAyaNa upanishad in support - nArAyaNa paro jyotir-AtmA nArAyanah parah. atra ayam purushah svayam jyotih (bRhadA. 4.3.9). SrI T. S. Krishnamoorthy translates Sri Sa'nkara's commentary as: "One Who is the light of self-luminous consciousness - He Who reveals Himself (without external aid), as well as other things - is jyotih". "Everything shines following Him alone as He shines. All this shines by His light". dyotate dIpyati kAntyA iti jyotih - He Who enlightens through His kAnti is jyotih. a) He of lovely effulgence - The Day time. b) One Who has the good desire or Will to protect the world. c) He Who is the cause of all the effulgence in everything. d) He Who has intense attachment to His devotees. ruc - diPtAvabhiprItau - to shine, to look beautiful, to be pleased with. sushThu rocata iti su-rucih - He Who shines beautifully and well is `su-rucih'. and interprets the current nAma as a reference to "Day time", which is the second step in the ascent of the mukta to SrI vaikunTham. The rising of the Sun is pleasing because of its effulgence. Since He is the cause of that beauty, He is called su-rucih. After agni to the deity of the day.., where the path to Brahman is described. SrI baladeva vidyAbhUshaN gives an interpretation that associates the nAma su-rucih to the daytime, similar to SrI BhaTTar. He by Whose Grace we have a pleasant day time is su-rucih. "One Whose Will is beautiful, auspicious and attractive". and gives the explanation for the nAma as "One who has good desire or taste to protect the world". c) SrI vAsishTha explains the nAma as a reference to bhagavAn being the cause of anything that is effulgent. both referring to this world being an expression of His Will or Desire. He Who is intensely attached to His devotees, is su-rucih. "abishva'ngaH = intense attachment, affection" to the word ruciH. He that is the Bright Fortnight of the Moon. The term hutam is formed from the root hu - dAnAdanayoH - to offer, to perform a sacrifice, to eat. `bhuk' is formed from the root bhuj - pAlana, abhyavahArayoH - to protect, to consume. One who consumes the offering is huta-bhuk - hutam bhu'ngte = huta-bhuk. The term vibhuH is defined by SrI vAsishTha as: vi is an upasarga or prefix, meaning vividha; the root bhU - sattAyAm - to be, to exist. vividho bhavati it vibhuH - That which manifests itself in different ways. SrI baladeva vidyA bhUshaN's vyAkhyAnam for the current group of nAma- s continues to parallel that of SrI BhaTTar. He interprets the nAma huta-bhug-vibhuh as a reference to the waxing period of the moon, the Sukla paksha, similar to SrI BhaTTar. His explanation is: huta- bhuk = candraH, vibhuH = pUrNaH, yatra sa huta-bhug-vibhuH Sukla pakshaH.. He because of Whom His devotees have all their darkness removed just like Sukla paksha is called `huta-bhug-vibhuh'. (The translator of SrI vidyA bhUshaN's vyAkhyAnam in Hindi says - "jinkI kRpA se bhakton kA nitya Sukla paksha hai, arthAt unke sarva andhakAr dUr ho jAtA hai |"). SrI Sa'nkara treats "huta-bhuk-vibhuh" as containing two nAma-s: huta-bhuk, and vibhuH. The dvaita AcArya, SrI satya sandha tIrtha, and SrI satya devo vAsishTha also follow the same system. With this pATham, the nAma huta-bhuk re-occurs in Slokam 95 in the pATha-s of both above vyAkhyAnaa-kartA-s (In SrI BhaTTar's vyAkhyAnam, the nAma is treated as ananta-huta-bhug-bhoktA in Slokam 95, as we will see later). i) He Who is the Consumer of oblations in homa-s etc. ii) The Protector of the sacrifices. i) The interpretation given by SrI Sa'nkara for the instance of the nAma in the current Slokam is: "He Who is the Consumer of the oblations". SrI Sa'nkara's words are: samasta devatoddeSena pravRtteshvapi karmasu hutam bhu'nkte bhunakti it vA huta-bhuk - "Though offered to different gods in sacrifices, He is the real Enjoyer, or He protects the offerings". ii) For the instance of the nAma in Slokam 95, Sri Sa'nkara gives the interpretation - hutam bhunakti it buta-bhuk - He Who protects the sacrifice. SrI vAsishTha explains that hutam refers to the offerings in the fire during homa etc., accompanied by the associated mantra-s: hutamiti agnau prakshiptam sa-mantram. He refers us to the seven tongues of fire that we have described earlier, under the nAma sapta-jihvaH: sapta te agne samidhaH sapta jihvAH (yajur. 17.79). He further adds that its is this `huta-bhuk' guNa of bhagavAn that is reflected in, and is responsible for, our being able to consume the offerings in the form of food to our body. Associated with the prANa vAyu that we inhale and the fire that is in our body, this food or offering gets `consumed'. i) He Who is present everywhere, or Her Who is the Lord of all the worlds. ii) He because of Whom al the beings of this universe become distinguished. iii) He Who manifest Himself in different forms. SrI Sa'nkara's interpretation is: sarvatra vartamAnatvAt trayANam lokAnAm vibhutvAt vA vibhuH - Because He is everywhere, or because He is the Lord of all the three worlds, He is called vibhuH. SrI cinmayAnanda translates the nAma as "All-Pervading" - Lord nArAyaNa, the Self, is unconditioned by time or space, for He is Eternal, the Omnipresent. He is All-pervading as He is unlimited by any conditionings. ii) SrI satya sandha tIrtha gives the interpretation - viSishTA bhavanti asmAt it vibhuh - Since beings become distinguished and distinct because of Him, the Lord is called vibhuh. iii) SrI satyadevo vAsishTha interprets the nAma as: vividho bhavati iti vibhuh - He Who manifests Himself in many forms is vibhuH. a) The Sun in his uttarAyaNa or Summer solstice. b) He Who is responsible for the ability of all cetana-s and acetana-s to make sound. c) He Who is praised by His devotees. a) SrI BhaTTar uses the root ru - Sabde - to sound, and interprets the nAma as as rUyate - praSasyati iti ravih - One Who is praised. In his mapping of the nAma-s of this Sloka with the different steps in the arcirAdi mArga, SrI BhaTTar interprets the nAma as "One Who is praised as the uttarAyaNa, or the Summer solstice" - the period in which the Sun begins his movement towards the north. uttarAyaNa is the fourth step in the arcirAdi mArga (see the detailed introduction at the beginning this Slokam). yad-anukampayA uttarAyeNa yAti iti arthaH. He by Whose Grace the sun is able to traverse the uttarAyaNa mArga, is raviH. SrI Sa'nkara explains the nAma as a reference to the Sun - Aditya AtmA - The driving force behind the sun. `rasAn Adatta iti raviH' - The Sun has the name ravi because he absorbs all the rasas or fluids from all objects. SrI Sa'nkara quotes the vishNu dharmottara 1.30.16 in support of his interpretation - rasAnAm ca tathA AdAnAt ravih iti abhidhIyata. "Of Aditya-s I am vishNu, of luminous bodies I am the radiant Sun". b) SrI vAsishTha derives the nAma from the root ru - Sabde - to cry, to yell, to sound as bees; The application of the uNAdi sUtra 4.139 - "aca iH" leads to the word raviH - the Sun. SrI vAsisTha indicates that the affix `i' adds the sense of "one who does", "one who causes others to do" - kartari karaNe vA. So in his interpretation, the term raviH means "One who causes sound", or "One who enables others to make sound", and indicates that it is because of Him that the beings are able to create sound, and so He is called raviH. He Who is praised by His devotees is raviH. a) The Illuminant (the year). b) He of various splendors - such as Sun, moon, day, night, etc. c) He Who shines in the minds of His devotees in various special ways. d) He Who gave special sight (divya cakshus) to arjuna, sa'njaya etc. (vi-locanaH). The root from which the nAma is derived is `ruc' - dIptAvabhiprItau - to shine, to look beautiful, to be pleased with. vi- is an upasarga or prefix. The pratyaya which leads to the word rocana from ruc, (the pratyaya yuc, which becomes ana), has the sense of "one who has a habit of", according to SrI vAsishTha, who gives pANini sUtra 3.2.149 - anudAttettah ca halAdeh - in support. Thus, virocate tacchIlo virocanaH - He Who has the habit of, or for whom it is part of His nature, to shine and to look beautiful. He Who is naturally shining, and Who enlightens this Universe, is virocanaH. a) SrI BhaTTar explains the nAma as "dvAbhyAm ayana-gatibhyAm samvatsaro rathena virocayati iti virocanaH" - He is the year that illuminates the Sun when he rides his chariot through the two ayana-s or the two periods of six months each (the uttarAyaNa and the dakshiNAyana - the summer solstice and the winter solstice). This is the fifth step in the arcirAdi mArga (see the detailed introduction at the beginning of this Sloka). SrI baladeva vidyA bhUshaN continues to parallel the interpretation of SrI BhaTTar - virocayati samvatsareNa gacchantam svopAsam abhiprautam dIpra'nca karoti it virocanaH - He Who makes the Sun shine as he travels through the samvatsara or through the year. b) SrI Sa'nkara explains the nAma as "vividham rocata iti vi-rocanaH - He of various splendors. One translator gives the example of His shining in forms such as the Sun, the moon, etc. ; another refers to His shining as the day, night, twilight, etc. ; SrI rAdhAkRshNa SAstri points to His providing various types of rays to assist in the growth of the plants etc. c) SrI kRshNa datta bhAradvAj points to His shining in special ways in the minds of His devotees - viSesheNa rocate bhaktebhya iti virocanaH. He quotes the yajur vedic mantra - namo rucAya brAhmaye (yajur. 31.20). SrI cinmayAnanda notes: "Whatever form the devotee chooses to contemplate upon Him, the Lord manifests in that very Form for the sake and joy of the devotee". d) SrI satya sandha tIrtha gives an alternate pATham -vi-locanah - One Who gave the special sight to arjuna, to sa'njaya etc. - divyam locanam pArthasya yasmAt sa vi-locanaH. He supports his interpretation with a reference to the gItA - divyam dadAmi te cakshuH (gItA 11.8). a) The source of movement in the form of wind. b) He Who brings forth everything, or He Who brings forth wealth. c) One who generates SrI or brilliance in sUrya or agni (sacred fire). d) He because of Whom we get enlightenment. SrI vAsishTha derives the nAma from the root sR - gatau - to go, or sU - preraNe - to excite, to impel. The pANini sUtra 3.1.114 - rAja sUya sUrya ..leads to the word sUryah by the addition of the kvip pratyaya. sarati gacchati iti sUryah, or suvati karmaNi prerayati lokAn iti sUryah. "The term etymologically means the One Source from which all things have been borne out, or out of which they have been delivered. The Lord as the First Cause is the Womb of the Universe". The term is commonly used to refer to the Sun, because on the surface of the world it is the Sun that nurtures and nourishes all living creatures. a) SrI BhaTTar interprets the root sR with the meaning `to move'. He notes that the kRt affix (kvip in the present case) has got wide application, and the meaning of the affix is not restricted. Thus, the word sUrya can be interpreted in a way suitable to the context, and he interprets the term in association with `vAyu', since the wind always moves out of Him - vAyuh sadA sarati yasmAt iti sUryah. In other words, he maps the nAma sUrya to the sixth step in the arcirAdi mArga. SrI baladeva vidyA bhUshaN also gives the same interpretation - vAyum sarati svopAsakam nItvA iti sUryah. SrI rAdhA kRshNa SAstri explains the nAma as a reference to One Who streaks through the skies like a snake (sarati). This can closely relate to the interpretation of the nAma as a reference to the wind. sa vAyu lokam (kaushItakI upa. 1.3) - "He (the jIva) goes to the vAyu loka). One translator translates this to mean "He Who brings forth everything, or He Who brings forth wealth, is sUryah". Another translator gives the following as the interpretation - "One who generates SrI or brilliance in sUrya or agni (sacred fire) is sUryah". sUri gamyatvAt sUryah - He because of Whom we get enlightenment is suryah. sUribhih j~nAnibhih prApyate iti sUryah - He Who is attained by the enlightened Sages. a) He Who produces or brings forth the crops etc., in the form of the Sun. b) He Who brings forth everything in the Universe (including the sun etc.). This nAma occurs again as nAma 969 (Slokam 104). SrI vAsishTha derives the nAma from the root sU - prANi garbha vimocane - to bring forth, to produce. BhagavAn produces, through the sun as the medium, rain and the crops, and so He is called savitA or Aditya. This is the seventh step in the arcirAdi mArga. He Who brings forth or creates all the Universes. prajAnAm tu prasavanAt savitA iti nigadyate || (vishNu dharmottara 1.30.15). savanAt savitA - (maitrAyaNi 5.7). "sa pitA - He, The Father of All". He Who creates grains etc. through rain by means of the sun and generates and sustains life, is savitA. a) He Who illuminates (through the rays of the sun). b) He that has the Sun for His eye. c) He from Whose eyes the Sun was born. d) He Who is fond of praise. That which reveals everything to us through its luster. The root from which `locana' is derived is `loc - darSane - to see'. ravi refers to the Sun. ravi raSmi sa'nkrAntyAdi mukhena candra-vidyud-varuNAn locayati iti ravi- locanaH. and the kaushItakI Upanishad passage - sa varuNa lokam (1.3), are invoked in support of the interpretation. He Who has the Sun as His eye is ravi-locanaH. "He Who has fire for the crown of His head, and Who has candra and sUrya as His eyes". cakshoh sUryo ajAyata (Rg. Veda 10.90.13). He Whose eyes are the Sun, and through which we see - locyate anena iti locanaH, raviH locanam = cakshuH yasya sa ravi-locanaH. d) SrI raghunAtha tIrtha seems to derive his interpretation based on the root ru - Sabde - to sound, for the word raviH, and gives the meaning `praise' for the word `raviH'. His interpretation for the term locanaH is "One Who is pleased", probably based on the root loc - to shine. His interpretation for the nAma is: raviH stutiH; locanIyatvAt locanam priyam; raviH stutiH, locanam - priyam yasya sah ravi-locanaH - He Who is fond of praise, is ravi-locanaH.